Centrally located in the heart of 'Eat Street', Parramatta, Restaurant 317 offers a separate gluten free menu containing delicious meal options. Additionally, many of the regular main meals can be adapted to gluten free, making up about 90% of the menu. Pizza is a real specialty of Restaurant 317, and gluten free bases are bought in. All of the pizza toppings are gluten free, including the BBQ sauce. Gluten free gnocchi is home-made on the premises. Penne and spaghetti are served, as well as a selection of delicious gluten free pasta sauces. Risottos also feature on the menu, along with side dishes. There is a selection of gluten free desserts to satisfy sweet cravings. A children's menu is also offered. A private dining room (for up to 10 people) is the perfect venue for small business meetings, and small celebratory gatherings. There is also a lounge area that caters for 20-25 people. Phone the restaurant to discuss your requirements. 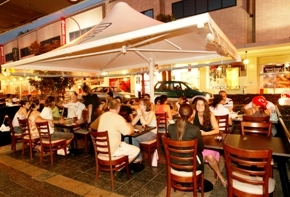 Winner of 'Best Restaurant in Parramatta' (Parramatta Advertiser) in 2006, 2007, and 2008, and a Finalist of the Gold Award Entertainment Card (Best Fine and Contemporary Dining category), Restaurant 317 offers a casual and relaxed atmosphere during the day, and a warm ambience in the evening. With a minimalist, open plan design, and trendy alfresco courtyard, it offers a great eating experience. Functions catering can also be arranged. Please phone Restaurant 3one7 to discuss your requirements.